All music and lyrics written, produced, and performed by Matt and Andrew Como. Aaron Sterling on Drums. Andy Burton on Keyboards. Sean Hurley on bass, Matt Como on guitar and lead vocals, Andrew Como on guitar and vocals. Engineered and Mixed by Kenta Yonesaka. Also engineered by Frank Mitaritonna and Tom Happel. Recorded at Germano Studios NYC and VuDu Studios on Long Island. Mastered by Herb Powers Jr. Produced by Matt and Andrew Como. Written by Matt and Andrew Como. Aaron Sterling on Drums. Andy Burton on Keyboards. Andrew Como on guitar and lead vocals, Matt Como on guitar and vocals. Engineered and Mixed by Kenta Yonesaka. Also engineered by Frank Mitaritonna. Recorded at Germano Studios NYC. Mastered by Herb Powers Jr.
Aaron Sterling on Drums. Andy Burton on Keyboards. Matt Como on Bass. Andrew Como on guitar and singing lead. Sam Woolf doing harmonies, Engineered and Mixed by Kenta Yonesaka. Also engineered by Frank Mitaritonna and Tom Happel. Recorded at Germano Studios NYC and VuDu Studios on Long Island. Mastered by Herb Powers Jr. Produced by Matt and Andrew Como. Written by Matt and Andrew Como. Photo by Rick Wenner Photography in Brookyln, NY. Produced by Matt and Andrew Como. Engineered & mixed by Kenta Yonesaka. Assistant engineers: Manny Park, Matt Sim. Additional engineering by Aaron Sterling on "Maybe I'm Just Feeling Lonely". Keyboards: Andy Burton. Mastered by Herb Powers Jr. Recorded at Germano Studios NYC. Song "Hollow" co-written with Stanley Lynch, Matt Como, Andrew Como. Produced by Matt Como and Andrew Como. Engineered & mixed by Kenta Yonesaka. Assistant engineered by Manny Park, Matt Sim. Additional engineering by Aaron Sterling. Keyboards: Andy Burton. Percussion: Aaron Sterling. Bass: Sean Hurley. Mastered by Herb Powers Jr. Recorded at Germano Studios NYC. All music and lyrics written and produced by Matt and Andrew Como. Photo by Rich Balter Photography. Cover Artwork by Marissa Como. Recorded live at 89 North Music Venue in Patchogue, Long Island, NY. Mixed by Mike Watts. Engineered by Frank Mitaritonna and Tom Happel. Assistant engineer Nick Starrantino. Mastered by Joe LaPorta Sterling Sound Mastering NYC. Aaron Sterling on drums. Andy Burton on keyboards. Featuring Sam Woolf on Hey Jude on vocals. 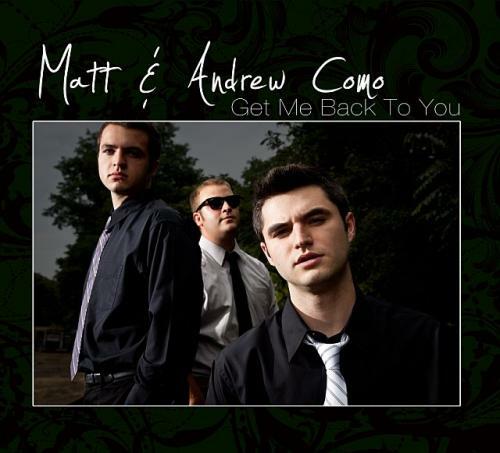 All music and lyrics written and performed by Matt and Andrew Como. Photo by Rick Wenner Photography. Recorded at Germano Studios, NYC. Produced by Graham Marsh. Engineered by Graham Marsh and Jason Staniulis. Steve Jordan on drums. Andy Burton on keyboards. Album released October 1, 2013. Photo by Ann and James Como. Recorded at VuDu Studios in Port Jefferson, NY. Produced by Tom Flynn and Mike Watts. Drums: Dan Gluszak except for Bad Karma (Andrew Como). Saxophones: Pasquale T. Ianelli. Trumpet: Andrew Mericle. Casey Crescenzo: Mellotron strings and Rhodes on Chasing Ambience. Released on March 14, 2013. Released on January 26, 2012. Recorded at VuDu Studios in Port Jefferson, NY. Produced by Tom Flynn. Mixed by Mike Watts. Mastered by Steven Haigler. Drums: Dorian Costanzo. You Are My World was featured in MTV's The Real World. Can I Be Matched With You? was featured in E! Entertainment's Keeping Up With The Kardashian's. Released on December 21, 2010. Matt and Andrew recorded this 5 song EP after they first started writing songs. This EP was recorded in the midst of their very early development as songwriters and performers. It is an exclusive look back on how their earliest songs sounded when Matt and Andrew first started to chase their musical dreams. Dorian Costanzo is featured on drums.